This shoes is a steven Madden called messy leopard and its very confortable and wearable both inside or outside the house. It is the most easy shoes to have and a must-have. 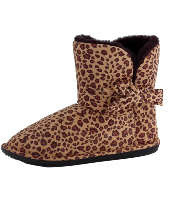 It can be a slipper or a boot, this Missyy Leopard Ankle High Slipper Boot is sure affordable. As I said it can be either worn indoors or out, you will be in such style. Leopard shearling upper with a super soft faux fur lining in black. Round toe. Bow ties on side. Black rubber sole is flat. Available in whole sizes only. Fabric upper, man made sole. Imported.